Pocket hole woodworking joinery methods have been around for a while, but the Kreg toolmaking company has taken that classic idea and ran with it. The result is a family of jigs that takes the set-up headaches and guess work out of the equations involving calculating drilling depths and figuring angles. Specific tool kits in the family includes the Kreg Jig® Master System (K3), the Kreg Jig® (K4), the Kreg Jig® Jr. (R3), and the Kreg Jig® Mini (MKJKIT). Why so many? Simple; theres something for every need and skill level, from Joe Blow that repairs the odd chair to the cabinetmaker who puts his tools through their paces every day. So what Exactly is Pocket Hole Joinery? For the most part, the community of woodworking tool manufacturers address one thing that is specifically encapsulated in the personality of the carpentry enthusiasts that buy their creations: the desire for no-nonsense, to-the-point, highly-descriptive, and in your face communication. The hype around this tool seems to deliver just that. A woodworking jig is just a helper tool that makes the project go a little easier. Many jigs are homemade contraptions but more commercial ones are available all the time. Joinery is just what it sounds like; the joining together of two or more components. Specifically, a pocket hole joint is a technique where at least one but possibly more holes are drilled (these are the pockets) at a standard or calculated angle through the first piece. Then, a screw is inserted through the hole and screwed into the second piece. What are the advantages of this method? Three come to mind right away. First off, the hole is at an angle, so that the strength of the joint is increased. In addition, in many cases, the pocket can be situated in a place where it wont be seen in the finished project. Finally, no glue or clamping is required, which fits the bill when a fast repair is required. Heavy-Duty Case. With all quality tools, this is essential for organizing. If you are anything like me, this point is critical. Drill Bit with Depth Collar and Allen Wrench. The included step drill bit has been designed to work synergistically with the kit with respect to the adjustable depth collar which is secured to it. This ensures that its sized properly for the guide. In an effort to make the setting of the collar as painless as possible, Kreg toolmakers molded a trough onto either side of the body. This sets the bit in securely while at the same time securing the collar at the precise depth. All the measurements are provided in inches but their metric equivalents are embossed upon the body as a nod to our woodworking friends in Canada, Latin America, and Europe. The Pocket Jig Body (The Benchtop Base). This component can be thought of as the heart of the Kreg K4 jig. The best way I can describe it is as a versatile clamping vice. I say versatile because it can be secured to a work bench permanently or on a temporary basis, as your situation requires. Batch jobs or now-and-then honey-do repair jobs? Drill Guide. This component does just what it says; it provides a guide for your drill bit. A combination of holes are available (called A, B, and C), so that proper spacing can be set up for 1 to 2, 2 to 3, 3 to 4, or even wider stock lumber. This drill guide usually secures to the jig body for project joinery or may be removed for repair work. You decide. A Toggle Clamp. This clamp secures to the jigs body, using an adjustable lever/piston/pad device. 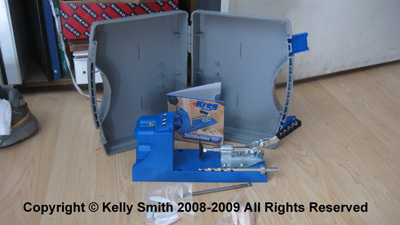 The function is to hold your work piece securely while you drill your pockets. A 6 Square Driver Bit. A square driver bit is recommended when installing your screws. Stripping is virtually eliminated using a square rather than a Phillips screw bit, which is why you see so many deck builders using them. A Starter Assortment of Screws. My kit came with a nice assortment of self-tapping screws to get me going (and hopefully intrigued with their brand for later purchases). A Starter Assortment of Plastic Caps and Solid Wood Plugs. Most projects are better when the holes are hidden, but in some cases, with pocket joinery, they can be left as is. Whether you need them most of the time or not, it is always handy to have a few laying around. I prefer the wood plugs because they add a decorative touch to a finished project. Last but Not Least, an Instructional DVD. This DVD came with the kit. It covers jig set-up, use, as well as 10 skill-building chapters that will help you complete projects like leg and rail joints, picture frames, tabletops, and furniture repairs. A picture, as they say, is worth a thousand words. After a few test runs, I give this jig a thumbs-up for both the novice and the seasoned woodworker. It is easy to use and takes up very little room in the wood shop. In most cases, a good jig shouldnt be considered a shortcut, but just another tool to make the job easier and to provide more professional results.